Welcome to the Crowne Plaza Chicago SW-Burr Ridge! Our hotel is conveniently located off of Interstate 55 in the SW suburb of Burr Ridge. We are conveniently located minutes away from Chicago Midway Airport and Downtown Chicago. Our complimentary area shuttle goes within 5 miles of our location, making it easy to experience everything the city has to offer; shopping, golf, restaurants, and entertainment. Our Burr Ridge hotel has everything you’ll need to stay productive and rested. Finish any work in our 24-hour business center, which provides copying, printing and scanning services, and choose from a variety of healthy snacks at the Energy Essentials Station. 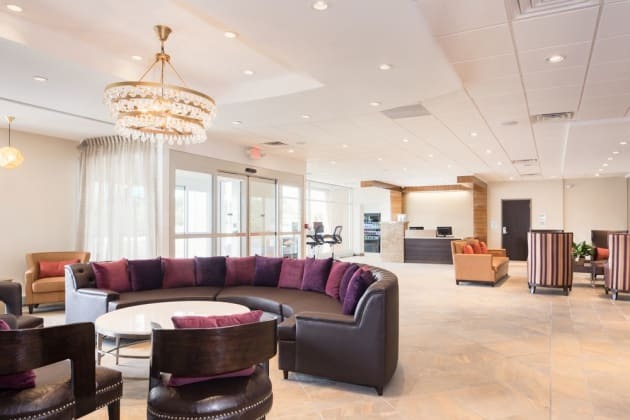 With over 7,300 square feet, three flexible rooms, and catering options, our event space stands out among hotels in Burr Ridge and surrounding cities. Hold everything from board meetings to conferences to weddings with ease. Our location makes it easy to enjoy leisure time too. Our hotel is surrounded by the area’s top golf courses, shopping, and restaurants. As a hotel close to Chicagoland Speedway, Chicago Center, Soldier Field, and Wrigley Field we are also the perfect place to stay for sports fans. While you’re here, start your day with a delicious breakfast at Kassidy’s. Head to our 24-hour fitness center for a workout before relaxing by the indoor pool. Later, dine and savor drinks or watch the game at Kassidy’s Sports Bar. Sip & Savor Cocktail & Eats is a restaurant/bar located on the ground floor of the hotel. Offers a variety of American cuisine from appetizer, sandwiches to hot plated sumptuous meal. For your convenience, room service is available from 6am - 10pm on weekdays and 7am - 10pm on weekends. Bar is open 7 days a week from 5pm till 11pm.Sip and Savor Cocktails and Eats offers a creative food and drink scene that reflects the vibrant aesthetic of the hotel. Enjoy eclectic regional cuisine and share fare, including sandwiches, salads, burgers and entrees, sourced from local farms when possible. Enjoy classic and artisan cocktails, local brews, and wines. Sip and Savor Cocktails and Eats offers a relaxed setting to enjoy a great meal and conversation.